House fires are heartbreaking. Flames not only destroy personal possessions, but the lives of people who once filled the home. It only takes a few minutes for an entire residence to be engulfed in flames. Heat is even more life-threatening than the fire itself, with room temperatures reaching up to 600 degrees at eye level. Smoke and toxic gases from house fires kill more people than flames do, according to Ready.gov, the official website of the Department of Homeland Security. In the aftermath of a house fire, attention turns to rebuilding and recovering what can be salvaged from the damage. But even then, a virtually invisible risk factor may exist — one that is just as deadly as the fire itself despite not being an immediate health threat. That risk factor is asbestos, a naturally occurring mineral used as a ubiquitous ingredient in fire-resistant construction materials for much of the 20th century. Asbestos can be found in cement sheets, roof adhesives, floor tiles and even drywall. It was commonly used to insulate attics, wall gaskets and wiring. Asbestos is fireproof and extremely durable. It is considered safe when left undisturbed, but as products are damaged or wear down over time, toxic asbestos fibers are released into the air. When a person inhales or swallows airborne asbestos fibers, they can become lodged in the body permanently. Over many years, these fibers damage cells, cause inflammation and may lead to cancer such as mesothelioma. Bethel said homeowners often think of asbestos as they do black mold, especially after disasters such as a flood or house fire. They know they should avoid it, but ultimately overlook it in efforts to recover their belongings and priceless possessions. “When it comes to rummaging through damage and debris, they don’t care, they just want to find those pictures,” Bethel said. Bethel also said people often think they can recognize health dangers such as asbestos, but unlike black mold, it is rarely noticeable to a naked eye. Asbestos fibers are microscopic. Tens of thousands of fibers clustered together appear as a mere speck on a surface. The only way to be 100 percent safe from asbestos exposure is to have an air monitor or inspector come in and test the area for contamination. Bethel says anyone living in a home built before 1986 is most at risk. This is because despite tougher restrictions on asbestos-containing products and air quality in the 1970s, many asbestos products remained on shelves through 1985. After a house fire, asbestos-containing products such as insulation, floor tile and even old appliances could lead to airborne asbestos fibers. In the event someone is determined to sift through the damage after a house fire, they should take precautions such as using amended water and wearing a respirator with a high efficiency particulate air filter. Firefighters help tremendously with this because they douse the house in water, even after the flames are put out. But damaged asbestos-containing products can dry out by the time firefighters deem the structure safe for families to recover items. 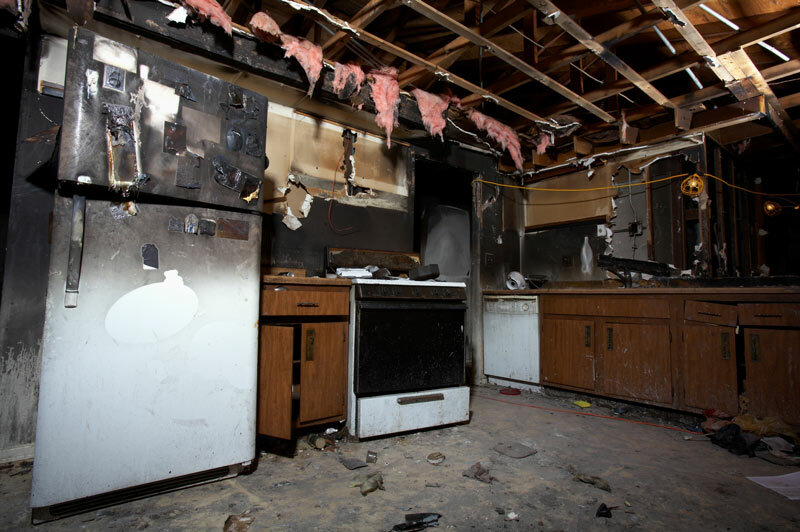 Moving burnt up boards, beams and appliances can stir up dust that may contain asbestos fibers, leading to exposure. Bethel said the most common mistake he sees people make when it comes to protecting themselves from asbestos is wearing a simple dust mask instead of a half-face respirator approved by the National Institute for Occupational Safety and Health. Homeowners should also wear disposable coverall suits and protective gloves when in an area possibly contaminated with asbestos. Still, Bethel urges that the safest decision after a fire in an older home is to bring in a professional inspector, who would need to test everything.